In SMART|dynamics of masonry volume 3, number 4, Rick Roach, president of Barnes and Cone in Syracuse NY, shared a basic overview of allowable modifications to a concrete masonry unit that benefit many areas of the country with the adoption of the 2015 International Building Code. Approximately ten years ago, the National Concrete Masonry Association (NCMA) Education and Research Foundation began myriad research programs to address energy performance of CMU. The Foundation focused on determining if the ASTM C90 requirement for full webs on a concrete block was valid and whether modifying webs could improve energy performance. Additionally, the Foundation zeroed in on more accurately determining the design strength of a masonry wall when the prescriptive table was used-- the Unit Strength Method. For 70 years, ASTM C90 Standard Specification for Loadbearing Concrete Masonry Units required full webs, or a solid grouted assembly, for structural loadbearing block. It was believed that three full webs were required to transfer stresses from one faceshell to the other. Foundation Research demonstrated that was not the case. A new minimum web area was established that would ensure transfer of stresses between faceshells and also allow the web area of a block to be significantly reduced. Within one year of submitting the modification to ASTM, the new web requirements were adopted. A full review can be found in NCMA TEK 2-5B New Concrete Masonry Configurations under ASTM C90. A 12" block used to weigh about 59 lbs. Today, a 12" normal weight 2-web block weighs about 35 lbs. A 12" 2-web lightweight block can weigh just 27 lbs. Masons can lay more block per day with less fatigue. It is safer, increases the speed at which walls can be built and reduces costs. Another benefit is that the minimized web area means grout flows through the cores faster and the speed of construction is improved. The web change is a game changer. As the web area is reduced, so is thermal bridging. Energy performance improves. As such, pre-insulated block can comply with ASTM C90 and have less than one full web. Insulation inserts fill the void of the partial web and cover mortar joints. Energy code compliance with single wythe construction is practical in all climate zones. The second phase of the NCMA Foundation Research focused on demonstrating that the Unit Strength Table in the code was overly conservative. Configurations shown exceed the new ASTM C90 web requirements. The Foundation Research Program tested hundreds of prisms and showed definitively that the strengths of masonry walls listed in the codes were too low. Unit Strength was recalibrated with a 33% increase in the strength of masonry. 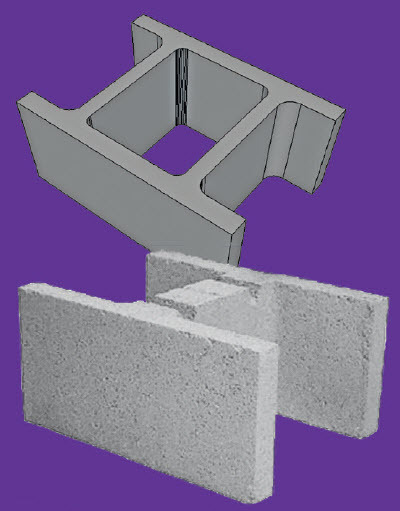 While every structure has its own unique conditions, this 33% increase, coupled with other newly introduced design efficiencies, potentially reduces the reinforcement in concrete masonry walls by 50%. This also provides a significant improvement for masonry insulation systems like injected foam; there is potentially less grout and reinforcement in the wall, which means potentially fewer locations with no foam insulation. Changes to ASTM C90 give producers the full flexibility to take advantage of 21st century material science. These changes can facilitate a creative period in the industry that can fuel masonry’s resurgence. Renderings show the inside web area of a block wall with one face removed. L to R: 3-web (2 core), 2-web (1 core) and 1-web.